Ready to leave a Legacy for Android? Say what you will about Gameloft's 'derivative' approach to creating games, the company is becoming one of Android's most dedicated supporters. Granted, the iPhone usually sees Gameloft's titles first, but the Android ports are rarely more than a few months behind and offer the same awesome visuals and highly polished production values. Eternal Legacy is no exception. It looks just as aesthetically impressive as it did in its iOS outing, offering the kind of visuals one would expect to see on a console like the Nintendo Wii or PlayStation 2. Character detail is incredible, and some of the battle effects make other Android games look hopelessly primitive in comparison. Taking a massive leaf out of Final Fantasy's book, Eternal Legacy boasts its fair share of moody teenagers, short-skirt wearing female warriors and super-powerful enemies hell-bent on destroying the world. The plot is probably one of the weakest elements of the entire package, offering nothing that hasn't already been seen a billion times before in a billion another other Japanese RPGs, but for three quid you can't moan too much. In terms of bangs per buck, you're getting more than your money's worth here. Combat in Eternal Legacy is similarly cliched, but it does at least offer a reasonable degree of excitement. You're able to chain together attacks and magical spells, allowing you to forward-plan your strategy as the battle rages around you. Once you get a team together these encounters can become surprisingly intense, and the high visual standard ensures you cheer every successful attack, and wince each time your foe manages to counter. Gameloft has provided Eternal Legacy with a lengthy single player quest, but some of that play time feels artificially inflated, as numerous side missions keep you running around in circles for little reward. Again, this is a hallmark of many other JPRGs and hardly a fault unique to this particular game, but it could cause some players to lose interest. Like the vast majority of Gameloft's Android games, you won't find Eternal Legacy on the Android Market. Gameloft continues to use its own site to sell its wares, and while this was initially annoying, we have to admit we've become rather used to it now. Once the game is installed it checks for new updates each and every time you fire it up, which allows you to capture any improved or enhanced versions Gameloft might make available at a later date. 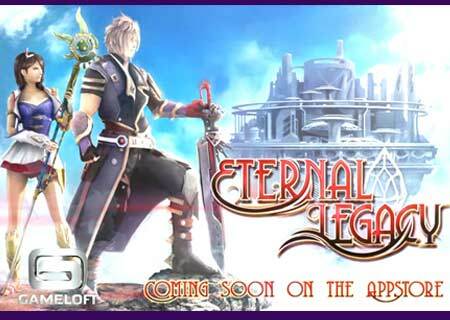 If you're a fan of Final Fantasy-style RPG epics Eternal Legacy is likely to hit the spot. While many purists will consider it nothing more than a shameless clone, it does a lot of things so effectively you could be forgiven for assuming that RPG veteran Square Enix was involved with its inception somewhere along the line. Once you complete the main adventure there's little reason to return, but for the price of a pint of beer Eternal Legacy offers top-flight entertainment and impressive value for money, making it well worth a look.